This is the time of the year when many species of spiders in Ohio begin to reach their maximum size as they fully mature. Two of our larger native spiders are the Black and Yellow Garden Spider (Argiope aurantia) and its similarly showy cousin, the Banded Garden Spider (A. trifasciata). Both belong to the orb weaver family (Araneidae), so named because of their flat, circular webs. The webs produced by orb weaver spiders are intricate structures involving both sticky and non-sticky silk. Non-sticky silk is used for "radial threads" which radiate from a central point like spokes on a bicycle wheel. The non-sticky silk is also used for "frame threads" which encircle the web like a bicycle wheel to hold the radial threads in place and to attach the web to supports such as plant stems. "Spiral threads" are composed of sticky silk arranged in a spiral pattern emanating from the center of the web; it's the sticky silk that captures the spider's prey. A web characteristic that is shared by these Argiope spiders is the inclusion of a vertical, zig-zag pattern of dense silk, called a "stabilimentum," that is oriented downward from the center of the webs. Many insects are capable of seeing light in ultraviolet wavelengths that are invisible to our eyes, and certain flowers that appear white to our eyes actually reflect intricate patterns of ultraviolet light, presumably to attract insects. Research has shown that when some Argiope spiders and their webs are viewed under ultraviolet light; the spider disappears, the web disappears, but the zigzag stabilimentum blazes like a giant neon "eat here" sign. Insects may be lured to their doom thinking they are visiting the mother of all flowers! 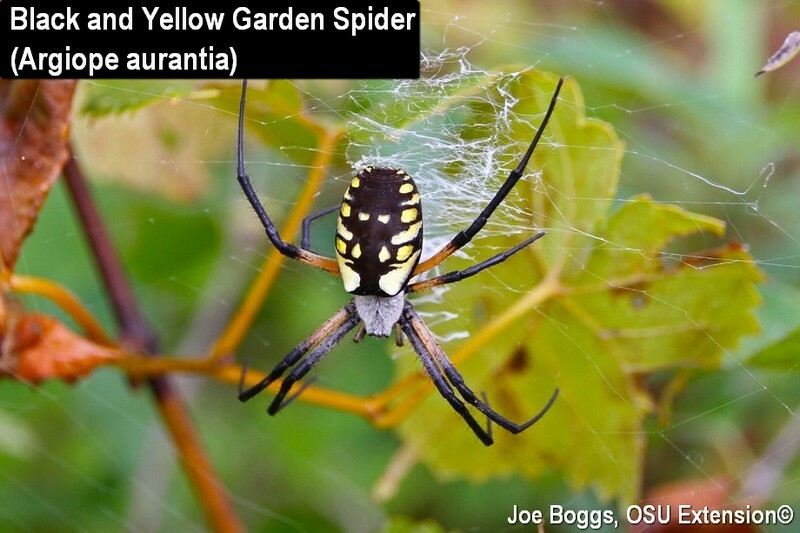 Both the banded garden spider and yellow garden spider practice a "wrap-and-bite" strategy to quickly dispatch large prey such as grasshoppers with minimal risk to the web … and the spider's health. When a victim becomes entangled in their webs, the spiders rush over to rapidly spin their hapless prey while wrapping them in a thick shroud of dense webbing. After wrapping their prey in silk, they then jab their fangs (chelicerae plural; chelicera singular) through the exoskeleton to deliver a venomous brew containing both neurotoxins to halt the insect's struggling and necrotoxins which are digestive enzymes that dissolve the insect's innards. The spider then hauls its catch back towards the center of their web and attach their bagged victim to their web to await the work of the enzymes. Later, they will have jab their chelicerae through the silk to enjoy an insect Slurpee.